EinGedi beach is located near Kibbutz EinGedi, at the center of the Dead Sea. Entrance is free of charge and there is a large parking area right outside. EinBokek beach is located on the southwest coast of the Dead Sea, near the hotels and right near the EinBokek shopping center. The beach is open to the public, free of charge. This innovative fantasy world offers a unique thrill for visitors to the area. Experience a movie full of special effects and cutting-edge technology, and visit the Fear Factory for a terrifying and gripping adventure. Learn about a fascinating natural phenomenon that occurs at the Dead Sea – formation of diamonds and pearls made of salt. Pere Hamidbar organizes hikes, extreme trails and attractions for the entire family, and produces outdoor family events. 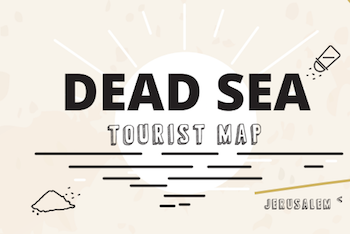 Masa Midbar Jeep Tours offers rides through the Dead Sea landscapes. EinGedi Springs offers guests a holistic, natural experience for the body and the soul. The EinGedi Spa features a beautiful beach alongside the waters of the salty sea at the lowest place on earth, and the famous Dead Sea black mud. Masada jeep rides include stops at observation points so that visitors can absorb the spirit of the desert and take in the breathtaking landscapes. Parts of the route are steep and others are more level. SunAir leisure flights over the Negev, Arava, Dead Sea and Judean Desert landscapes. Book a flight for a fun experience, a romantic gift, birthdays, or any other occasion. Suitable for all ages.